Montrose Terrace is at the east end of central Edinburgh, just off the A1 (London Road). We’re near Easter road, and just around the corner from Holyrood Palace and the Scottish Parliament. We’re just a few minutes’ walk from the city centre and the bus and train stations. You’ll find plenty of convenient free parking at nearby Meadowbank shopping centre, or parking meters on Hillside Crescent and Regent Road. Some free parking is also available on Montrose Terrace where indicated by signs, except from 8:00-9:15am and 4:30-6:00pm. 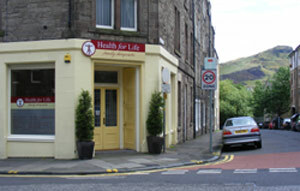 Find us on our sunny street corner on Montrose Terrace, just around the corner from the Palace! We are located on the ground floor and are wheelchair accessible. Please be aware that our toilet facilities are located downstairs and are not wheelchair accessible. Please contact us if you have any enquiries about accessibility, including accommodation for sight or hearing impaired persons.